Kaspar Astrup Schroder director of Big Time a documentary that took six years in the making was in Chicago to present his film during the Chicago International Film Festival. I was able to speak with him via phone as I was unfortunately unable to meet him that day in Chicago due to a family wedding. The Wall Street Journal has stated that Bjarke Ingels ‘has rapidly become one of the design world’s biggest stars’ and his name recently appeared in TIME magazine’s ‘100 Most Influential People’ article. The film Big Time focuses on the New York skyscraper VIA 57W, which houses the newly opened multiplex Landmark at 57 West, and World Trade Center 2. 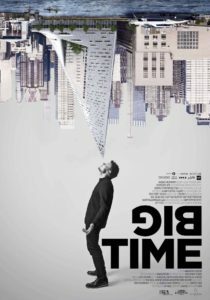 First and foremost, I learned so much about the topic of architecture and architects by viewing the highly engaging and personalized film, Big Time. The film is for everyone of all ages, especially those interested in architecture. Schroder has captured his subject during his triumphs, frustrations, and disappointments. You’ll see Bjarke Ingels’s childhood home, see his parents speak about him as a child, you’ll hear about his philosophies and the reasoning behind his drawings. But most importantly, you’ll see him with a pen and paper drawing/creating his projects as he explains to us the ‘why’ behind his design style. The film has a personal connection as well, during the six-year filming period; Ingels began to deal with serious health problems that did interfere with his work. You’ll also view his euphoria in finding the love of his life and his engagement to his lovely girlfriend during this time. Sarah Knight Adamson: I want to thank you so much for speaking with me today. I really enjoyed your film. 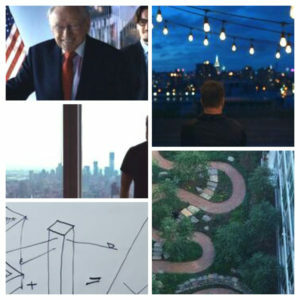 Can you tell me why you chose to start filming Bjarke Ingels? Kaspar Astrup Schroder: My wife is an architect, my sister is an architect, most of my friends are architects, so I was kind of in that environment, and I love making films. I’ve watched a lot of documentary films about architecture that I thought it was very challenging to make something interesting that goes beyond like a normal film. I wanted to broaden up the subject so people that are not architects might become interested in architecture. I started filming him back in 2010, and I completed the shoot last December 2016, six years. SKA: What aspects of his life were you looking to cover? KAS: I wanted to make a film about architecture through character, through someone that lives it and makes it. I also wanted to show their dilemmas of the modern man trying to conquer the world but maybe one that also forgets himself in it. When Bjarke started to become sick and then the company was failing after he left Denmark and all those challenges could basically have been in any business. KAS: I wanted to tell those emotional, universal aspects of a story and try to also develop a character through the film. He’s a great storyteller, and he’s trying to make the best possible life for people with his architecture. SKA: One thing I did read about him and I think I saw something online that he was talking about; his number one goal in architecture is to care. I think you just addressed that issue. That’s one thing I was going to ask you about. He’s such a caring person. KAS: Yeah, he is. He’s very down to earth. I mean, he’s got four hundred or so employees now but I know he wishes he only had five that were his best friends. He likes that relationship with all his employees. He also wants to make the biggest, wildest and craziest projects in the world. SKA: How many employees does he have now? KAS: I think it’s four hundred fifty. SKA: It was so wonderful to really watch him work and when he was drawing and explaining the process while he was creating, could you talk about that for a little bit? KAS: Yeah, so during those six years, I basically didn’t see him design much with a pen because he’s over all projects and he’s commenting on all the teams, their work, and pushing them in certain directions, but he’s not holding the pen. I really feel like if you want to give him some credit or understand him and his ideas, he had to have a pen in his hand. The very last thing we shot was last year, was all those setups where I picked five projects, and he drew. SKA: To watch him go through that process, and it’s so visual. That’s wonderful. Thank you, that’s great that you filmed that. It’s my favorite part of the film. KAS: It’s a necessary part of the film. It was something that I kind of invented at the very last minute. We had edited, and I was like there’s no designing. There’s no drawing. We’ve got to have him draw. SKA: That’s wonderful. Have your own personal views of architecture changed? KAS: Yeah, I think they have. 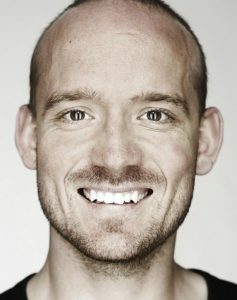 I think I’ve learned a lot from Bjarke being around in Denmark we have a strong tradition in architecture and design. It’s all about minimalism and aesthetics. It is really about the social impact a building can have, and I think with my storytelling it was also about making films more universal. SKA: Great, if I were to visit Denmark, I’ve visited quite a bit of Europe, would you suggest Copenhagen? KAS: There are not that many cities. I like two big cities and the country. If you’re interested in architecture, then yes, Copenhagen. There’s also Aarhus, which is thriving. It’s really developing new architecture. SKA: The Lego Land building alone would be worth the visit, and now he’s working on the new IKEA building. I didn’t realize the extent of the pressure that goes on till the end, and the element of compromise that architects go through during the process. Could you talk about that for a little bit? KAS: Yeah, isn’t that something? I grew up in architecture, so I know that there are so many visions that never get built, and especially with architecture, there’s always something that has to be cut out. It’s always the nice details. The grass on the roof, it’ll just be a normal roof or whatever. That’s really something that is annoying to the artist especially, that they don’t have full scope and then there’s always some cut downs, and it goes over budget and then they have to cut out all the fun parts of the projects. KAS: He’s really trying to avoid that, every time he goes into a project. You know, then with the economy and such, and in Denmark, he’s actually been blamed a lot for having bad detailing. Which is not true, he’s actually turned affordable housing, into a very crazy, fun, fantastic project. The Eight House for example in Copenhagen, it’s a huge building, but it was supposed to be cheap housing for students, and there are a lot of things that had to be cut off because it was built in 2008 during the financial crisis. SKA: Oh, I didn’t know about that. KAS: He often gets, it’s always the architects that get the blame because it’s the design that is reflecting something that actually the designer didn’t have an impact on, but it’s of course the architect that is designing it, so they give the blame. He’s really annoyed with that. SKA: I don’t blame him. What surprised you most when you’re all finished with the film? You probably had expectations when you started and through the process, was there anything in the film you’re like ‘oh wow okay’? KAS: To be honest it was a difficult film to make because I didn’t want to make a commercial for his company. SKA: Well, right. There was probably a fine line there. KAS: There were challenges. Then when we started assembling and I was editing, and I had another editor as well, things started to fall into place, and that was a like, ah thank God that all this, I thought I had wasted my time on filming a lot of stuff that started to pick up back in the film. KAS: Yeah it’s a very slow and long process. We edited for twenty-four weeks I think. SKA: Well I’m happy that you added the love interest at the end. KAS: I wanted a happy ending. SKA: Yes, the boy gets the girl at the end. KAS: I know that’s kind of a cliché; I didn’t really have an ending for a long time. Everything was just going so well with the company and new projects coming in, but I thought it had to end with a personal part that had kind of evolvement from him, in the beginning, being alone and then in the end, he’s in a car with a girl and that’s what really matters. SKA: I want to thank you so much for speaking with me and good luck with the film and good luck with the film festival and hopefully I’ll be speaking with you again about your next film. KAS: Yes, that would be great. Thank you very much. 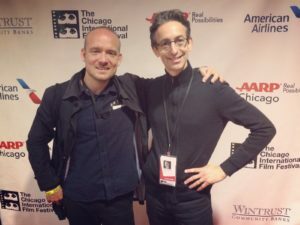 Kaspar Astrup Schroder director of ‘Big Time’ with Anthony Kaufman, a Chicago International Film Festival programmer. Sarah Knight Adamson© October 14, 2017 All photos were provided by the Chicago International Film Festival unless noted. Big Time will be screening in New York City in November! December “Big Time” is opening at New York’s Landmark at 57W theater, which Bjarke designed.